New Jersey is in the throes of dealing with a long-overdue gas tax increase – or of just letting the state’s transportation trust fund fail. I suppose it’s pretty predictable that some participants in a debate like this will generate rhetorical fog. My friend and colleague Jack Lettiere has just confronted (see http://politickernj.com/sponsored/when-it-comes-to-fixing-our-infrastructure-just-the-facts/#.V3GAZpMrIdX) a bogus analysis making the rounds in New Jersey, which asserts that New Jersey’s “real problem” is “out of control spending,” with the implication that no tax increases are necessary. Jack carefully pulls apart this very wobbly analysis, which was put forward by the Reason Foundation. What he doesn’t say – and what I think should be added to the discussion – is that the Reason Foundation isn’t some impartial think tank. It is an ideologically driven, quasi-libertarian group that opposes public works in general. And by public works in general, I mean just that. Raising money from taxation to support infrastructure investment is something that the Ayn Rand crowd just finds repugnant. The Reason Foundation is the biggest of these groups, but there are many spin-offs around the country, coming up with arguments to shoot down taxation for all sorts of transportation programs and projects. They often give special attention to public transportation – which they really dislike – and they get really excited about opposing streetcars! The takeaway? Those of us who are advocates for public investment in infrastructure – desperately needed to bring our nation success in the 21st century – need to be vigilant about the facts and vigorous in pursuing our case. Happy 50th Birthday New Jersey DOT! I was honored recently to take part in a festive 50th birthday celebration for my agency “alma mater,” the New Jersey Department of Transportation. The highlight of the celebration was an appearance of 12 former commissioners and acting commissioners of the department, whose NJDOT history went back as far as the 1950s. The panel discussion of the 12 veterans included many reminiscences, a few revelations, and lots of expressions of warm feelings toward each other and toward the agency staff. I think it reaffirmed the view of many of us that this is an organization with a real heart and soul. 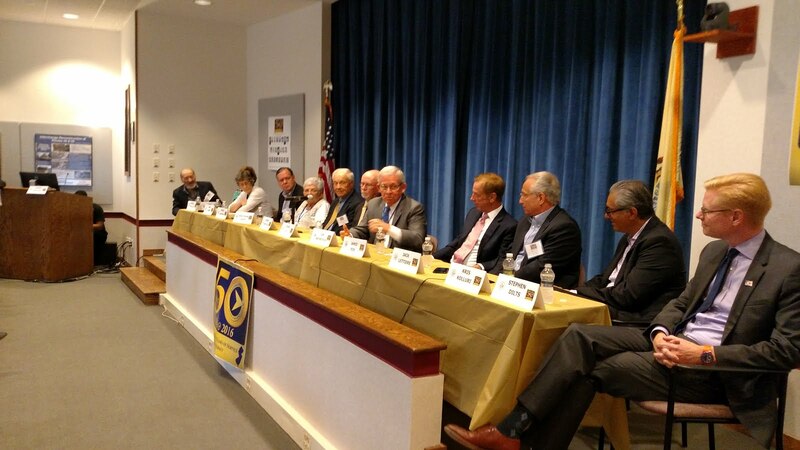 Of course, the warm and fuzzies at any such celebration avoid a lot of the more painful episodes of the past, but on balance NJDOT has a lot to celebrate for the past 50 years and many exciting challenges to look forward to in the next 50!